The doctors at the Cherry Ridge Veterinary Clinic want to make sure you know what heartworm disease is and why we stress the importance of year round heartworm prevention. Heartworm disease is extremely serious and is transmitted to your pet by mosquitoes. One bite is all it takes. When a pet is bit by a mosquito, the heartworm larvae called microfilariae is transmitted into their blood stream. Once in the blood stream the larvae migrates into the heart and blood vessels of the lungs.They then mature into adult heartworms and can grow up to a foot long. The heartworm's job is so restrict blood flow throughout the body. Some pets show symptoms (coughing, lethargy, loss of appetite, difficulty breathing, vomiting, and weight loss) but many show no symptoms. If a dog tests positive for heartworm disease they can be infected with several dozen worms at once. You may still wonder why it is so important to protect against these pesky mosquitoes carrying heartworms and the number one reason is that they are everywhere and number two is that it only takes one bite. Heartworm disease is very expensive to treat and painful to your pet, but most importantly it can be fatal if left untreated, The good news is that heartworm disease is preventable. We recommend testing your dog for heartorm disease every year. We can incorporate this in with your pet's annual exam. It only requires a small blood sample. 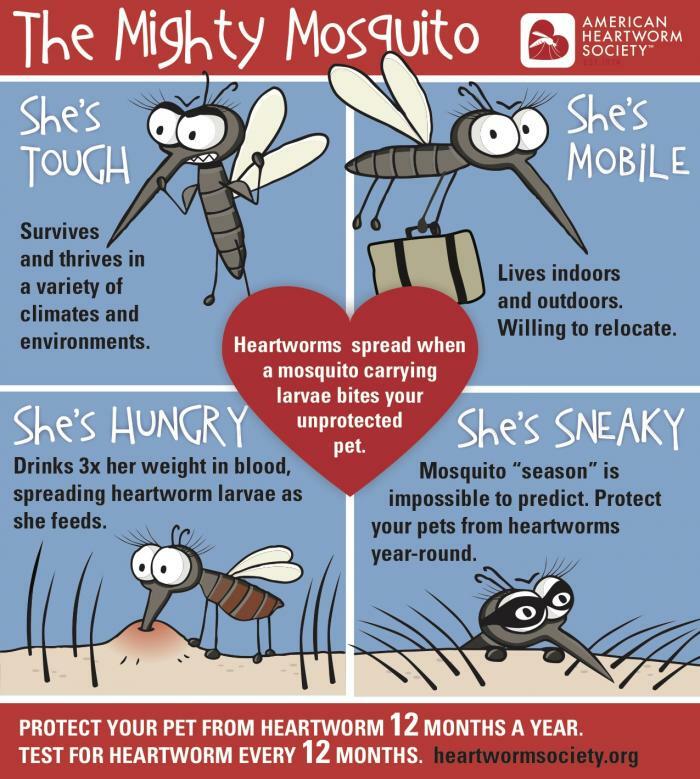 We also recommend giving heartworm preventative every month. Year round heartworm prevention is cheaper and easier on you and your pet than treating the disease. It is estimated that you can buy seven years of heartworm preventative for the cost of treating heartworm disease once. We carry several once a month products to protect your pets. The preventatives are flavored tablets that also include medications to prevent heartworm, intestinal parasites like hookworms, whipworms, and roundworms, and some even help protect against fleas Cats can also get heartworm disease but it is difficult to diagnose. Revolution is a topical monthly product for cats to prevent heartworms.